The Pioneer DJ DDJ-400 is a portable two-channel Rekordbox DJ controller aimed at new DJs. It’s got two jogwheels, looping controls like those found on a CDJ-2000NXS2 media player, three-band EQs and a filter per channel, eight performance pads per deck plus a DJM-style Beat FX section. It’s a solid first controller for those looking to get into DJing, and for club and pro DJs who are looking for a compact set-up they can use at home or on the go. The DDJ-400 is a two channel controller meant to be used with Rekordbox DJ, which also comes bundled with the unit. It’s got three-band EQs, trim pots, filters volume faders and a crossfader in the mixer section, along with the requisite browse and track load buttons. There are two decks on the DDJ-400, with each deck having a 5” jogwheel, eight small performance pads with pad mode buttons: hot cue, beat loop, beat jump, sampler, keyboard, pad fx1, pad fx2, and key shift. It’s also got a pitch fader and a loop section which looks similar to a CDJ or XDJ media player. If you’ve been using Pioneer controllers for a while now, you’ll notice that the decks don’t have their own FX sections, which usually consist of some knobs and buttons above the jogwheel. Instead you’ve now got a Beat FX section in the right side of the mixer. The rear has a RCA Master output jacks, a 1/4” mic input with level knob and a USB jack. The front of the unit has an 1/8” output jack for your headphones. The jogs on the DDJ-400 are similar to the jogs on the DDJ-RB. They’re touch capacitive, like all the other DDJ controllers, and they are not mechanical like the ones found on the DDJ-1000 or on CDJ / XDJ media players. They’re responsive and we liked how they felt – they’ve got a nice heft to them similar to what you would expect on other DDJ controllers. The main difference with the jogs on the DDJ-400 is how they look – they have a glossy top that provides more traction when you’ve got your hands on the jogwheel platter, and a rubber rim like those found on a CDJ or XDJ for a grippier pitch bending experience when nudging a track forwards or backwards. Scratch DJs will love how responsive these smaller jogs are – sure you’re missing a bit of the full-size traction and inertia of a meatier jogwheel, but they still feel great and scratching is indeed possible. The tempo faders on the DDJ-400 have also been upgraded and are now longer than the ones found on the DDJ-RB, which were really short-throw faders. This allows you to make more precise BPM adjustments when tempo matching two tracks. One of the big layout changes on the DDJ-400 are the looping controls. Instead of the usual auto loop buttons found on older DDJ controllers, or the Loop In / Loop Out controls in the DDJ-RB, you’ve now got a looping section similar to that of a CDJ or XDJ media player. It consists of a Loop In button that also doubles as a four-beat auto loop button, a Loop Out button, a reloop / exit button for either exiting or engaging the looped section again, plus Cue / Loop call buttons, which lets you cycle through Memory Cues and Loops. These Cue / Loop call buttons also double as loop half or loop double buttons, again just like those found on a CDJ or XDJ. 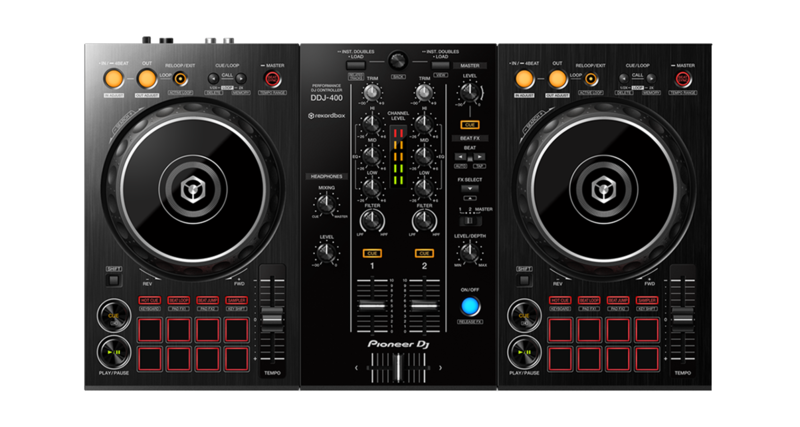 The reason for the shift is because again, Pioneer DJ seems to want to standardise the controls of their gear, whether that’s club gear or controller DJ gear for home use. I think it’s smart because I always found the loop controls confusing moving from a DDJ-RZ to a pair of CDJs. This way, looping becomes ingrained in your workflow, regardless if you’re spinning on the DDJ-400 or CDJs at the club. A wonderful addition to the DDJ-400 is the headphone mix knob, which lets you adjust what you’re hearing in your cans between the master output and headphone cue. This was absent in the DDJ-RB, which was a bit annoying because that meant that there wasn’t any way to fine tune the mix you’re hearing in your cans. The FX controls for both decks on the DDJ-400 are consolidated in the Beat FX section, right beside the mixer. You’ve got an FX select button, which lets you cycle down the list of available FX (or cycle up if you hold Shift). You also have two Beat buttons that let you shorten or lengthen the beat length or time of the effect, and you’ve got an FX deck select button – this lets you add effects to deck 1, deck 2, or anything coming out of the master output. Finally, you have a level / depth knob plus an effect on/off button. The controls and layout are similar to DJM mixers like the DJM-450 or the DJM-900NXS2, though the controls have been pared down to the absolute minimum. An FX Select knob would’ve been better than a button, as it’s quicker to go through effects that way. Of course, you can also just click and select the effect using your laptop’s trackpad, so it’s not a dealbreaker. I do miss the flexibility of the per deck FX section found on the DDJ-RB, but then again you don’t get any of that when you spin with CDJs at the club, so if you have club or pro DJ aspirations you’re better off getting used to the Beat FX layout. The DDJ-400 also unlocks a special tutorial section designed for new DJs to quickly get to grips with setting up the DDJ-400. 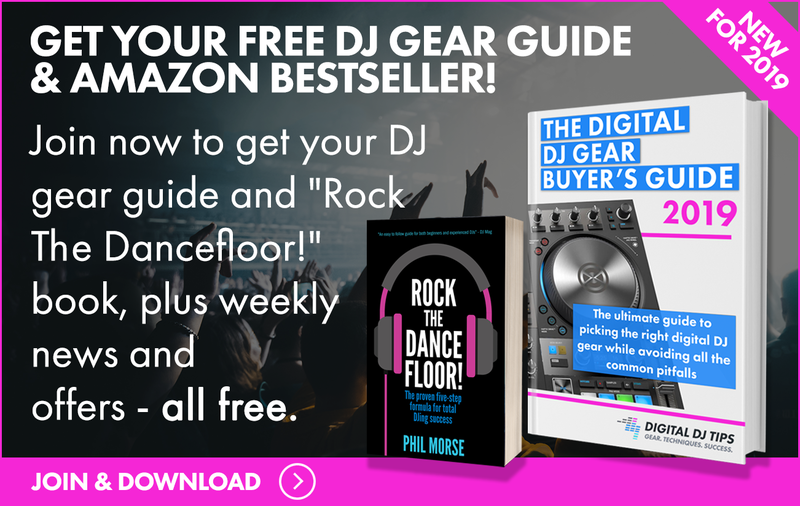 It’s also got some basic mixing tutorials, as well as a link to an archive of other Pioneer DJ tutorials for other kit in the Pioneer DJ product line. The DDJ-400 is a solid first controller for those looking to get into DJing – it’s got a full complement of contemporary digital DJ controls and performance features found on more expensive gear, plus it’s just the right size for cramped DJ booths and taking it along to house parties. There isn’t much in terms of innovation onboard, though, as it’s more of an evolution of the way Pioneer DJ is making beginner-focused gear instead of a revolution in the way it thinks about digital DJing. Pioneer DJ continues to make strides with its Rekordbox and Rekordbox DJ software, and it’s starting to pull away from other popular DJ apps. Emulating the layout of a club standard CDJ/DJM set-up in even the cheapest of gear means that the transition from bedroom to main room will be smoother for new DJs and those unfamiliar with how a CDJ/DJM set works. That also means that club and pro DJs looking for a small, cheap controller to take along with them on holidays and getaways will find the DDJ-400 appealing. Overall, a good entry-level deck packed with professional features at an attractive price point. I’m thinking of getting one of these, but it seems like they don’t have any way to control vinyl slip. Does that mean you wouldn’t really be able to switch back and forth between scratching and moving the track position (sorry, new here and not 100% sure that’s what vinyl mode does). If so, that’s a pretty major omission, right? The edge of the jogwheel is “nudge”, the top of the jogwheel is “vinyl”. So yes, you can do what you ask (it’s the same on most controllers, this is a “controller paradigm”). Hope that helps Steve! Thanks Phil. I was thinking it’s more how you can scratch and the underlying track keeps playing, similar to what the SLIP “button” does in Algoriddim dJay2 (I’ve been learning from your book, BTW – love it!). It seems like there’s no Slip toggle on the DDJ 400, but I’m not sure if experienced DJs would call that a handicap or not. Just something I want to consider before I buy. Not tried it Steve, but I think you should be able to remap a button you don’t use to do that using Midi mapping. Recommended controller to start with a good base or to the professional DJ that needs a backup controller. It is already plug & play to Virtualdj 2018 and works very well and stable. Algoriddim just updated DJAY Pro 2 for the mac to have the mapping for the DDJ-400. So far it seems to do everything, all pad modes, effects, etc. I am very impressed with the DDJ-400. Its a nice step up from my DDJ-Wego4. Its very light with little handles on the side. I think its great and you get the full rekordbox license with it as well. Awesome, thanks for the update Joel. Yes, you set it in the preferences (for instance, to 1/4 of a beat) and it just works. It’s a great starter controller, and comes with the full software which is always a plus. Would you still rate this controller below the inpulse 300? The Traktor controllers don’t currently work with the iOS app, but it’s widely believed a new app is coming soon, at least for the S2 (which has an iOS socket). Looking to get back into spinning some tunes, purely hobby maybe the odd house party. Had turntables for many years but had to sell all my gear so hopefully all the basics of DJing will come back to me. Would these be outgrown soon? Was looking at the ddj-600’s also, would these be more suitable? Are the 600’s due for replacement soon? Any opinions appreciated. Sorry Joey, meant DDJ-RR! It’s been around a couple of years I think. What would you choose between the 400 and the RR for someone getting back into it. Never done digital DJing before.